Random ballots for places at Wales' top schools should be considered to widen access to more disadvantaged pupils, according to an educational charity. The Sutton Trust said reducing the emphasis on how closely pupils live to a school would allow "fairer access" and limit parents "gaming the system". Schools with the best GCSE results have half the rate of pupils on free school meals compared with the Welsh average. The Welsh Government said the system in Wales was already more equitable. It said in most cases councils, not individual schools, control admissions. Researchers looked at the top 40 schools in Wales measured by the proportion of pupils who got at least five A* to C grades at GCSE. The rate of pupils in receipt of free school meals in those schools was 9.6%, just under half the overall Welsh figure of 18.8%. None of the top schools had a rate of over 20%. Some of this is explained by schools having more affluent catchment areas. However the Sutton Trust said there was also a "free school meal gap" at some of the top 40 schools, meaning they had a lower free school meal rate than the catchment area. This was largely down to English-medium faith schools, which manage their own admissions, and Welsh-medium schools. Overall however, a higher proportion of pupils on free school meals attended the best faith schools than the other top-performing schools. Sir Peter Lampl, chairman of the Sutton Trust, said: "Getting a place at a good school is key to getting on in life. Yet the bottom line is that in Wales your chances of doing that depends on your parents' income and whether they can afford to live in an affluent area." The trust said the issue should be addressed because pupils attending the highest-performing schools are more likely to go to the best universities and succeed in top professions. 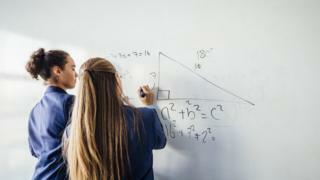 The Sutton Trust also said priority should be given to poorer pupils when schools are oversubscribed, and there should be a focus on improving the quality of teaching in all schools. The report called for a closer look at why pupils from low-income families are less likely to attend Welsh-medium schools and suggested ways of reducing barriers including providing better information to parents in deprived areas. "About a third of our children come from the most deprived areas of Cardiff but these families aren't recognised because we're using a very outdated system of measuring deprivation, which is free school meals," said John Hayes, head teacher of Ysgol Gyfun Gymraeg Plasmawr. "What we're losing in all of this are the working poverty families - many are aspirational and are working very hard, putting in two or three shifts possibly and because they're working so hard they're not able to offer that support around the breakfast table for their children." A Welsh Government spokesperson said their schools admission code helped ensure the system is administered in the "fairest way". "Admission authorities must ensure their arrangements will not disadvantage a child from a particular social group." Top comprehensive schools in England and Scotland also had around half the overall proportion of disadvantaged pupils.